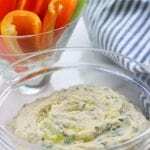 Simple White Bean Dip is a quick and healthy recipe perfect as an appetizer for a party or a fast afternoon snack. This recipe is so delicious you may find yourself craving this as a feel good lunch also. Place bean mixture into a medium sized bowl and stir in lemon zest and chives. Serve with favorite cut veggies or healthy chips.